The New Humanitarian | War remnants, pollution behind rise in cancer deaths? War remnants, pollution behind rise in cancer deaths? In the late 1990s 22-year-old Manal Sabir Abdullah from Basra was diagnosed with lung cancer, from which she eventually died in 2004. "Her cancer was bizarre as none of our relatives had cancer before and she had never had bad health or harmful habits," said her husband, Hassan Najim Ghanim. "None of the doctors could determine how she developed the disease but most believed it was probably caused by contaminated air, soil and water," he said. Remnants from Iraq's three recent wars - the Iran-Iraq war in the 1980s, the Gulf War in 1991 and the US-led invasion in 2003 - coupled with the absence of adequate government controls on emissions and industrial effluent, have turned Iraq into one of the world's most contaminated countries, say officials. "There are a number of environmental challenges in Iraq,” Environment Minister Narmin Othman told IRIN. “One of them is water, air and soil contamination caused mainly by emissions from cars and generators in crowded areas, unplanned use of chemical fertilizers, war remnants and bombing with depleted uranium." There was a lack of government supervision of the waste being discharged into the country's two main rivers - the Tigris and Euphrates. This included waste from heavy industry, tanning and paint factories, as well as raw sewage and hospital waste, she said. "The contamination levels are rising significantly in Iraq," she concluded. Les déchets issus de la guerre et la pollution, cause de la hausse de la mortalité liée au cancer? The US-led coalition forces used depleted uranium (DU) as a “penetrator “ at the core of armour piercing tank rounds in the 1991 and 2003 wars. Amid growing reports of ill-health among veterans, an international campaign has sought a global ban on DU weapons on public health grounds. The US Department of Defense has denied that depleted uranium is an exposure threat, but does monitor soldiers with embedded DU armour fragments as a result of combat operations. So far, the amounts of DU detected after tests “pose no known” health risk, William Winkenwerder, assistant secretary of defense for health affairs, said in a statement. But in a landmark ruling in September 2009, a British jury concluded that exposure to depleted uranium in the 1991 Gulf War was the likely cause of the colon cancer that killed British veteran Stuart Dyson in June 2008. 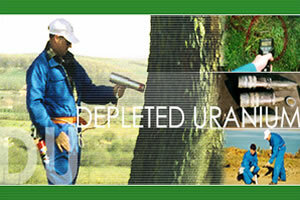 DU is a heavy metal and a by-product of the uranium enrichment process. It can enter the human body by inhalation, eating contaminated food, eating with contaminated hands or by exposing an open wound to contaminated dust or debris, according to Rahim Hani Nasih, a doctor in Mosul. It can also contaminate soil and water, and coat buildings with radioactive dust. Wind and sandstorms spread the contamination, leading to diseases, including cancer, Nasih said. In a 2005 publication, the UN Environment Programme identified 311 sites in Iraq contaminated with DU and said cleaning them up would require several years. No figures were available from the Ministry of Health on how many cancer cases might have been related to or caused by contaminated war remnants. Qusai Abdul-Latif Aboud, head of the Enhancing Health Directorate (EHD - affiliated to the Health Ministry) in the southern governorate of Basra, said war remnants in Iraq had become one of the main causes of cancer - along with smoking, emissions of harmful gases, and other kinds of pollution. An EHD study earlier this year had noted that 340 cases of leukaemia had been registered between 2001 and 2008 in Basra. This compares with 17 cases in 1988 and 93 cases in 1997, Aboud said. The study focused only on leukaemia, as cases of the disease had risen sharply in Basra. It also found that the amount of uranium in Basra’s soil had jumped from 60-70 becquerels per kilogram of soil prior to 1991 to 10,000 becquerels per kilogram in 2009. As much as 36,205 becquerels per kilogram have been recorded in areas with abandoned remnants of war. He said EHD relied on the media and community leaders to spread awareness about self-protection and how to avoid contaminated areas.